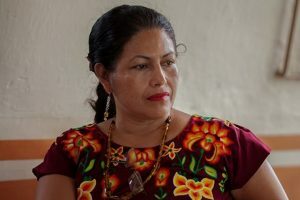 On October 4th and 5th, 2016, Bettina Cruz from the Mesoamerican Women Human Rights Defenders Initiative, traveled to Seattle to discuss the fight against climate change and land rights in Mexico. On October 4th, Channel Foundation, grantee partner Global Fund for Women, and Pangea Global Giving co-hosted a conversation that discussed the central role that women’s organizations throughout Latin America play in the struggle for justice and basic human rights. On October 5th, Channel partnered with the University of Washington’s Latin American and Caribbean Studies, American Ethnic Studies, American Indian Studies, and the Center for Human Rights departments to host an event where Cruz discussed her work in the struggle for Indigenous people’s rights.